Place des Arts is Canada’s largest performing arts center with 6 venues, 8,000 seats, 1,000 events and over 850,000 audience members per year. Its vast outside esplanade is the main gathering area for the millions of people drawn by festivals, so characteristic of Montréal. At the heart of a dynamic cultural crossroads, Place des Arts partners with countless promoters and producers, and has become a favored stop for artists on tour, a springboard for emerging artists and a refuge for artists in residence who create novel works within its walls. 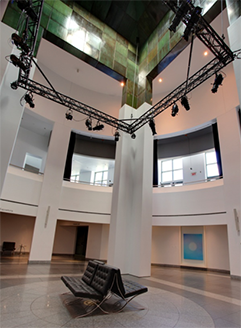 Among others, the Espace culturel Georges-Émile-Lapalme offers an exceptional access to the performing arts program, occupied as it is year round by 225 animated activities and exhibitions drawing more than 285,000 people. A government-owned corporation, Place des Arts, as part of its mission, introduces and teaches the arts to the next generation; thousands of youngsters from every neighborhood and background are invited to fascinating encounters with art and its creators. The Piano nobile in Salle Wilfrid-Pelletier—the large main foyer opening onto two wide staircases—is a central space well suited to private receptions, lectures, and talks. It was fully renovated in 2016. Among performances held in the space are some of the Sons et brioches shows in the Place des Arts Junior youth series. Overlooked by the work Les Anges radieux by Quebec artist Louis Archambault, the Piano nobile provides a spectacular view of the Esplanade thanks to its tall bay windows, and also looks out onto a work by Claude Bettinger called L’Artiste est celui qui fait voir l’autre côté des choses (An Artist Is One Who Shows the Other Side of Things). 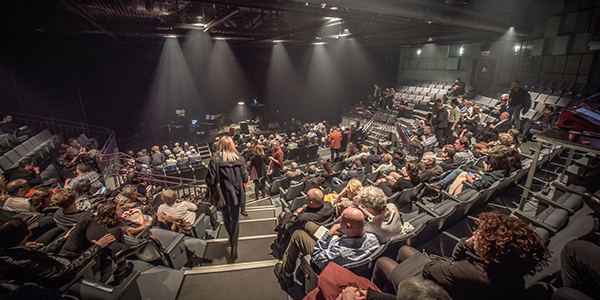 The Cinquième Salle is a performance venue adapted to meet the needs of creative artists seeking to make contact with curious audiences that are open to innovation. Highly versatile, with a variety of different configurations, it is the perfect space for modern dance, theatre, and song, as well as multimedia performances or any other kind of show. A trendy room with bold and modern architectural details, the Salon Urbain is located within Place des Arts’ cultural space, in front of the Maison symphonique. In both intimate and more open configurations, the Salon Urbain is an understated, elegant, modern space that is rooted in its surroundings, in the heart of Montréal’s Quartier des spectacles. On certain performance evenings, it is transformed to host the Salon Urbain, Comptoir gourmet, the perfect place to get a drink and a bite before a show. The Musée d’art contemporain’s Main Hall is an absolutely extraordinary space, with its four immense copper-clad columns that stand 15 metres high. Marrying straight lines and curves, the refined architectural aspects of this room are timeless. 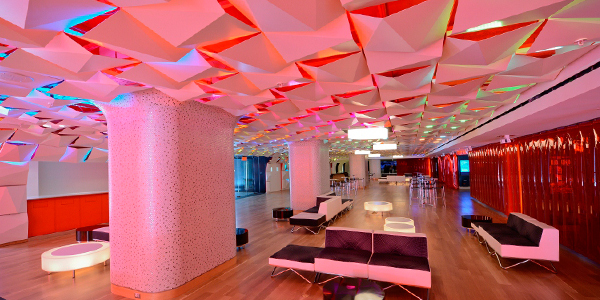 This unique and impressive space, with its high ceiling, is bathed in natural light during the day and becomes positively distinguished once the sun sets. Located in the heart of the Quartier des spectacles, the Musée d’art contemporain de Montréal makes today’s art a vital part of Montréal and Québec life. For more than fifty years, this vibrant museum has brought together local and international artists, their works and an ever growing public. 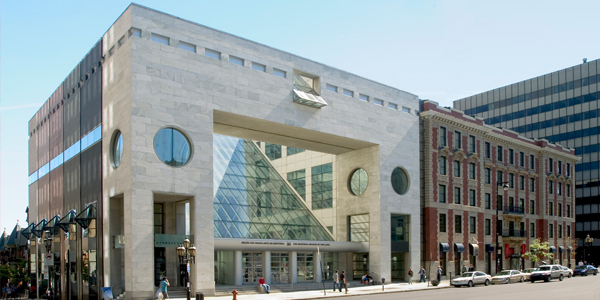 The Montréal Museum of Fine Arts (MMFA) welcomes a million visitors annually. Quebec’s most visited museum, it is one of the most popular museums in Canada, and ranks twelfth among art museums in North America. With their original designs, its temporary exhibitions combine the artistic disciplines (fine arts, music, film, fashion and design) and are exported around the world. 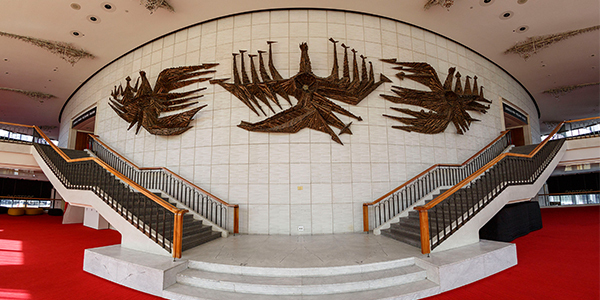 Its rich encyclopedic collection, distributed among five pavilions, includes international art, world cultures, decorative arts and design, and Quebec and Canadian art. 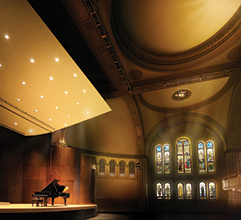 Bourgie Hall, part of the Montréal Museum of Fine Arts, is a concert hall located in the former Erskine and American Church, a heritage building designed by the architect Alexander Cowper Hutchison in the Roman Revival style, in 1894. Designated a historic place of national interest in 1998, this transformed building now boasts outstanding acoustics and exceptional décor that includes 20 historical stained-glass windows by Tiffany. Perfectly suited to the requirements of chamber music ensembles and other groups, such as string orchestras, Bourgie Hall offers music lovers experiences that reflect the MMFA’s encyclopaedic diversity. Eye-dazzling, provocative, elegant and playful. These are just some of the words that can be used to describe the Museum’s installation of decorative arts and design, which was unveiled in 2012. The galleries showcase 900 objects – furniture, glass, silver, textiles, ceramics and industrial design – from many different countries on display. Chagall: Colour and Music is the biggest Canadian exhibition ever devoted to Marc Chagall (1887-1985). Featuring 340 works of art and a large selection of documentary works, including films, photographs and musical excerpts, this multidisciplinary exhibition is the first to focus on Chagall’s profound connection to music in his life and work. In the heart of Montréal, Mount-Royal Park was conceived by Frederick Law Olmsted, America’s most renowned landscape architect. Since its inauguration in 1876, the park has been enriched by new works of art and constructions such as the Mount-Royal Chalet. 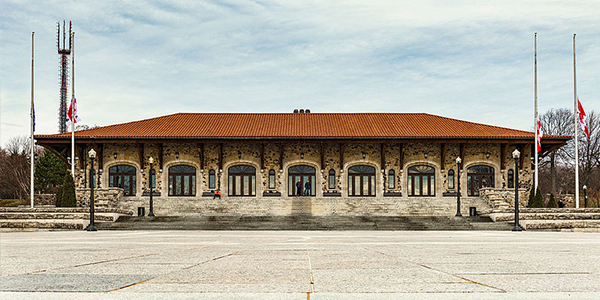 Built in 1932 by architect Aristide Beaugrand-Champagne, the Chalet thrones atop the Mount and offers a breathtaking view of Montréal and its surroundings. TOHU 360-degree circular hall is in the purest circus tradition. This distinctive feature can accommodate unusual shows and original creations. Also, the bleachers give the audience an impressive sense of closeness with the artists, allowing them to experience an overflow of emotions. TOHU hall, part of Réseau 360º, is one of the 14 circular performance halls in the world, most of them located in Europe. TOHU’s impressive 22.45-metre high and 40-metre diameter stage can accommodate up to 1 200 people!